AS I WAS UNABLE TO ATTEND the Governor’s Conference on Tourism in Las Vegas this week, I found myself reflecting on the Great State of Nevada and its future, imagining a speech from that bully pulpit that might help steer us there intact. With one thrilling exception, Nevada has always had its spy-glass fixed firmly on the past. For good reason — over most of our history, things were better then. That exception was the legalization of casino gambling and the reduction of the residency requirement for divorce. One helped build the state’s sustaining industry, the other made us competitive with the other states that had managed to get ahead of us. This apparition appeared shortly after Hallowe’en in Gold Hill, although we are informed it’s an attempt at a Christmas decoration. It was apparently conceived by CMI as a part of its “branding” of Gold Hill which it achieved by multiple strands of cheap Chinese lights. What a fabulous show! That was more than 80 years ago, meaning it is now close to a century since we did anything new or groundbreaking. In a way that’s good, as we have managed to avoid the mistakes made by other states, while they’ve rushed into ours. But it has also prevented us from taking advantage of our strengths and successes in the way we did back then. Let’s consider steps that will take us to a healthy and productive future. Here are five that came to my mind, in no particular order. At the bottom of this page you will find a comment form which I invite you to use to make your own suggestions, or make comments on mine. I’m sure there are more good ideas to be heard. 1. Establish a state bank. Study North Dakota‘s example — the state’s businesses were protected from the stenchy behavior of the Big Bad Banks. 2. Support the federal governance of public lands in order to preserve our greatest treasure: open spaces and big skies. The world is filling up with more and more people, and territory like ours, like the freedom it represents, is increasingly scarce. 3. Make Education the focus of a major state government initiative. A truly great education system is an engine for economic development and the quality of life. Right now we rank rather low on the list of over-all education excellence. We have to do better than we’re doing presently, and we’ve made what is intended as a strong beginning — why not aim for the top? We may never be Number One, but the closer we get, the better for everyone. The biggest gem in Tonopah nowadays is the new-old Mizpah Hotel, which now offers a memorable experience: mouthwatering meals, premium wines and luxurious beds in gracious rooms with all the desired amenities and fun activities – right in the center of town. Owners Fred and Nancy Cline threw a vibrant party Nov. 8-9 to celebrate the second anniversary of their beautiful Mizpah renovation, serving fine wines from their Cline Cellars and Jacuzzi wineries in Sonoma, Calif., and setting the evening’s tempo with live bands in the picturesque Victorian-style lobby. Two hotel dining rooms serve fresh, tasty meals, and the yummy salmon, huge juicy hamburgers and delicious pancakes were just three of the many menu choices to enjoy. The guest rooms are a welcoming surprise, blending historic elegance and modern comforts, including super restful beds with elegant down duvets, flat screen television and two dozen channels, free high-speed wireless Internet and comfortable air-conditioning — or open the window to fresh mountain air. Another nice surprise: fresh serve-yourself coffee all morning, just outside your bedroom door (no need to fuss with those questionable in-room pots). The Mizpah even has a Fitness Center, spa products and a Nevada turquoise, gem and gift shop where you can book a mine tour. The Clines plan to add soon a Mizpah casino and microbrewery. 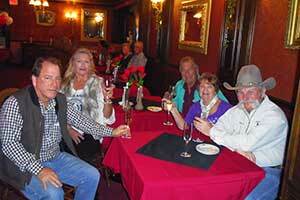 Nancy Cline’s Tonopah heritage includes her great uncle Harry Ramsey, who ran a saloon near the Mizpah in the early 1900s. What else to do during a Mizpah stay? The fascinating Tonopah Historic Mining Park is literally outside the Mizpah’s back door, the Central Nevada Museum just down the street, dig-your-own gemstones can be found in nearby fields, or you can browse western-style shops and take side-trips to Goldfield and several ghost towns. The whole amazing story unfolds in the new book “Mizpah Hotel: History, Happenings and Hauntings” by Janice Oberding and Virginia Ridgway, available at the hotel desk and elsewhere. 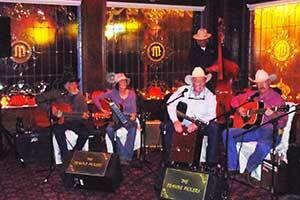 For more on the Mizpah celebration, read the account in Rural Nevada Online. 4. Do not allow Las Vegas to take other people’s water just because it’s bigger. Nevada’s future is bigger than Las Vegas and there are better sources of fresh water for the Las Vegas Valley, including trading desalinated ocean water for Colorado River water. 5. Police the mining industry. It has been willing to stiff the state of the revenue from its activities here. MOAC is an excellent beginning, but the tax rates are too low even if the cheating is minimized. The industry wrote the Constitution when the State of Nevada was desperate to be born, as its price to support statehood. We should declare it paid in full and now it’s time to reassess according to the facts in the 21st century. 6. Preserve communities from degradation and destruction from mining. Right now Gold Hill, Silver City and the Virginia City National Historic Landmark are being degraded and destroyed by Comstock Mining Inc. The company is not only taking our gold, it is destroying our history. If you look at it from the point of view of the people living through it, you have to ask what the Taliban is doing worse in Afghanistan. I had a telephone call from Joe Conforte the other day. And once again Joe puts a smile on my face. I feel the pull of his energy, as he buoys me wth his exuberance and sometimes makes me laugh out loud. I hadn’t heard from Joe for two or three years, and it was four years since I’d laid eyes on him at his Rio De Janeiro penthouse. He’d called because of a story he’d read in one of the Virginia City newspapers. It was a piece from 1959, reprinted as a part of the Nevada Press Association series of newspaper front pages collected for the Sesquicentennial and offered to members to republish. This one was from the Reno Evening Gazette, written by reporter Walt Mackenzie (he of the waxed mustachio, later of Sierra Pacific Power Co.) about Joe’s arrest for extortion of Bill Raggio. I explained that this was the old story from ’59, nothing current. “Okay, that’s good. I was worried I’d have to go to work, if you know what I mean. Put a stop to it. If that’s all it is, it’s all right.” We visited for a few minutes and he said he’d call again when I was home. I’m still waiting. 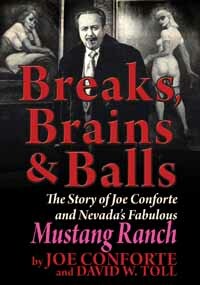 For those readers younger than 40, Joe Conforte was the hustler/trickster/entrepreneur who, with his wife Sally Burgess, transformed the Mustang Ranch from a broken down shack in the desert into an unofficial American National Monument. It was the first licensed brothel in the USA and famous around the world, and he did it with all the cards stacked against him, with every lawman in the state eager to bring him down. They put him in prison, they made him run for the border, they burned him out — and Sally too when he was in prison — but each and every time, he came back stronger than before. Today he’s living like a king in Rio on the proceeds from his Nevada life. He took on the world and he won. That’s why Joe Conforte is the first nominee for membership in the recently created Nevada Hall of Fame. While we seek an appropriate brick-and-mortar venue, a website is under development at nevadahalloffame.org. Historical Calendar, and its special 75th-Anniversary Edition of 2011. 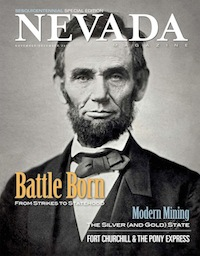 Find out more at nevadamagazine.com, or by calling 775-687-0610 . . . Retired CEO “Jungle Jim” Gibson of Gardnerville bought the ailing Morris Hotel on Reno‘s East Fourth Street, right between a homeless services facility and the train tracks. “It’s a terrible, terrible spot, but it’s perfect for Burners. 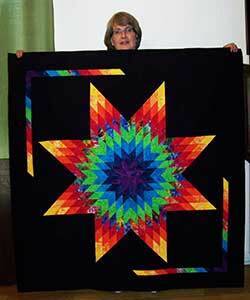 They love old things and recycling them,” says Ky Plaskon. He’s one of about a dozen volunteers working to renovate the building, now known as the Morris Burner Hotel, and turn each room into its own art installation. Gibson is bringing the building up to city standards in order to open a working hotel that abides by Burning Man’s 10 principles, essentially the social compact of Burning Man culture, centered around an inclusive community ethic, a DIY spirit, and a commitment to self-expression. Meanwhile, the hotel-in-progress serves as a gathering spot for creative folks such as fir performers, crafters, people who sew, and video artists. Nancy Brisack’s quilts — a tribute to craft, textile history and saintly patience — are on display at the Copeland Cultural Arts Center Gallery in Minden through January 2. The Elko Daily Free Press reports that in a recent five year span nearly 2,500 vehicle-animal collisions were reported across Nevada, and that as many more go unreported. That’s a lot! Half those collisions involve deer, so remember that many accidents are not due to colliding with wildlife but driving into another car or truck in the opposite lane while trying to avoid colliding with an animal . . . The Sierra Club filed suit to overturn a Lake Tahoe area development plan that affects the economic and environmental future of both California and Nevada. After 12 years of negotiating, California and Nevada reached a development agreement and the New York Times reported that the agreement would make for more construction in town centers around the lake, but the Sierra Club, according to the Times, “believes the plan will open the door to much more development than proponents claim”. . . In Rancho Haven, about 35 miles north of Reno proper (but still with a Reno address), ceramic artists Joe and Shiho Winter make mugs, vases, plates and other hand-crafted housewares to distribute to galleries around the country. To accommodate Christmas shoppers who’d rather head to the hills than head to the mall, they team up with Paul Herman of Great Basin Pottery, a few miles down the road, just over the state line in Doyle, Calif. 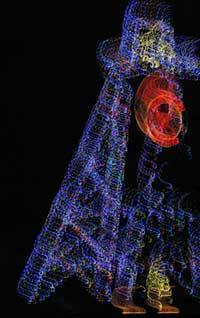 Both rural studios are open to the public each weekend 10 a.m. – 5 p.m. until Christmas. New this year: wheel-thrown beer growlers. Joe Winter has produced a line for breweries and a line for the holiday sale. (Might tempt a resurgence in jug bands?). . . Nevada began issuing specialty Nevada Airports Association license plates in September to benefit the state’s 44 rural airports. The plate reads, “Sky is the limit.” Of the $61 plate fee, $25 ends up in airport’s cash drawer . . . Heavenly and Kirkwood Ski Resorts opened November 22, Las Vegas Ski & Snow Board Resort opens November 29 and Sierra-at-Tahoe hasn’t decided yet . . . Anyone with a qualifying vehicle — quad, motorcycle, car or truck — can enter the Henderson 250. It’s the Best in the Desert Racing Association’s last race of the season, with festivities, registration, tech and contingency in downtown Henderson December 6, and the race starting and ending in Jean December 7. . .
Pinenut Mountains between Carson City and Yerington, the Clan Alpine and Desatoya Mountains east of Fallon, and the Excelsior Mountains southeast of Hawthorne. 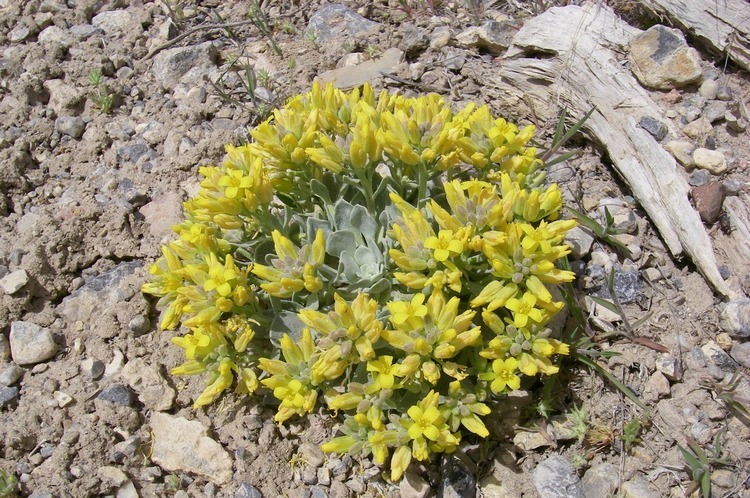 Contact Eric Baxter at the Winnemucca BLM Office, 775-623-1500 or Carson City BLM Forester Coreen Francis, 775-885-6161. For other areas of Nevada contact your local BLM or Forest Service Office . . . In November, a large, white A-shaped formation of rocks mysteriously appeared next to the hilltop “N” near the University of Nevada Reno campus. A few days later, KOLO uncovered the mystery, reporting, “Brent Wilbur of Reno was allegedly trying to spell ‘Tina,’ a woman he dated four years ago for nine months.” The Reno Gazette Journal’s Emerson Marcus elaborates . . . In Sparks when they say snowball season has opened, it’s not what you might think. Registration is open for the Sparks Deep Freeze Softball League until Dec. 12 at the Alf Sorensen Community Center, 1400 Baring Blvd. The 8-week season will take place on Wednesday evenings, January 8 – February 26, 2014, at the Golden Eagle Regional Park sports complex in all-weather conditions. For information, call 775 353-2385 or send an email . . . In Reno, Santa sings a special song just for adults: “You better break out/The Bourbon and Rye/Tequila and Gin/I’m telling you why/Santa Claus is coming to town.” That’s from the official song book of the Reno Santa Pub Crawl. About 12,000 Santas and other merry revelers are expected at this year’s annual crawl December 14. Those who like a dose of healthy activity before a night of merry carousing can register for The Great Santa Dash, a family-friendly 5K walk/run starting at Wingfield Park. I made this photograph at S-Line Reservoir in Fallon, Nevada. I often visit the reservoir to capture its beauty in different seasons. This image however was made in the rare moment when the sky fills with dark clouds accept for a small area on the horizon and as the sun rises the spotlight effect is created, lasting only for minutes. When this natural lighting phenomenon happens, it seems the whole world becomes magical with a special radiance.